Since 1980, Corinne Mentzelopoulos has been managing this historic first growth Bordeaux chateau and has been at the helm of its monumental success over the past few decades. 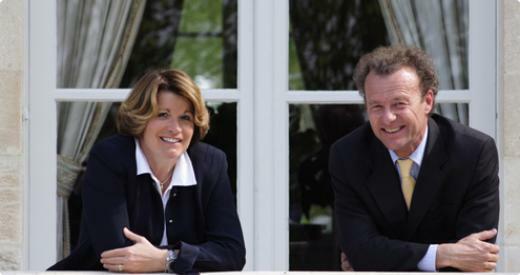 She immediately surrounded herself with the best people when she took charge, including Emile Peynaud and Philippe Barré at first and now with Paul Pontallier and Philippe Berrier. JCL: Which wine(s) are you most proud of and why? CM: I’m especially proud of the wines Château Margaux has produced ever since my family took over, in 1978. Still, in view of the centuries-old history of quality of the estate, going way back before us, I have to say I am proud of every single wine ever produced at Château Margaux. JCL: Among the wines mentioned above, describe one wine that you feel is the most reflective of Margaux’ unique terroir/site? CM: There are a few vintages however I cherish particularly: the 1978, because it is the first wine produced by my father at Margaux, the 1983, which is especially successful in all the Margaux appellation, the 1999 which is just delicious to drink now, and, last but not least, the 2010. I mustn’t forget to mention our 1961, which I have drunk over the last 30 years with the same emotion; it epitomizes what a great Bordeaux wine can turn into after many years of ageing, despite the fact it is already great when still young. This particularity of the greatest terroirs in Bordeaux is especially striking in the Château Margaux 2010, with its combination of purity and depth, its tannic but not aggressive structure, its length and freshness in the mouth. We believe such a perfect expression of our site has never been achieved before, and I cannot bear the thought I won’t be around to taste it in 30 years, especially if it proves to be superior to the 1961! Meanwhile I am going to make sure I drink many bottles of our 2010! JCL: Overall, are there more advantages or disadvantages in being a woman in your position (or is there no difference whether one is male/female)? CM: For me there is no difference, and I have never felt I behaved differently or like a ‘woman’, I am not sure in fact of what it means. JCL: What drives or inspires you to be the best at what you do? CM: Well in view of Château Margaux’s unique status, I ask myself all the time whether in fact I am doing the best, or not. JCL: What does work-life balance mean to you? CM: Still, my problem is I don’t have a wife!! At the end of the day, I believe women feel the need to be with their children more strongly and more often. JCL: If you could make wine in aother region in the world besides Bordeaux, where would it be and why? CM: Truthfully I don’t feel like going anywhere else. As of today, I know of no other wine region in the world with so many centuries of experimenting and with such knowledge and respect of our soil. Owning and running Château Margaux is in fact a privilege, and I am not sure there is another wine place in the world of which I could say the same.